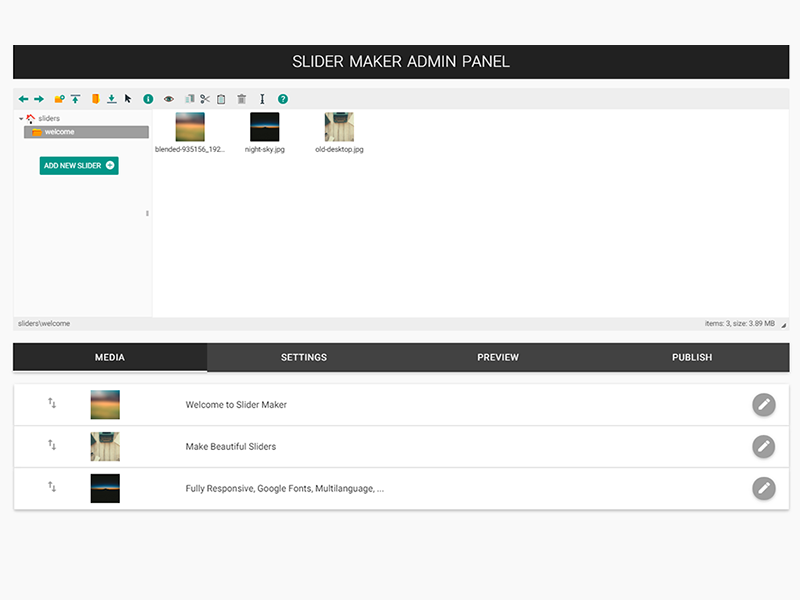 Slider Maker - Premium jQuery Photo Slideshow Builder. Build your jQuery Image Sliders in no time, using a user-friendly admin dashboard. Slider Maker is built with Google's Material Design, and includes all modern efficient tools you need to build responsive Web Slideshows, galleries and sliders, optimized for fast loading with Ajax, well-adapted images for all devices. Your Photo Slideshows will look well on all devices : large screens, desktop screens, tablets, small tablets and phones. Upload Slider Maker's main directory on your PHP server, and you're ready to go. There is no install process, no database required. Open integrated Admin Panel to start building your photo slideshow. Paste generated code on your page, your slider is ready. Lifetime usage for one project and awesome customer support included. slideshow maker, jquery slider, photo slideshow, jquery carousel, slideshow creator, image gallery, image slider, jquery image slider, slider maker Slider Maker - Premium jQuery Photo Slideshow Builder. Build your jQuery Image Sliders in no time, using a user-friendly admin dashboard. Build responsive Web Slideshows, galleries and sliders, optimized for fast loading.